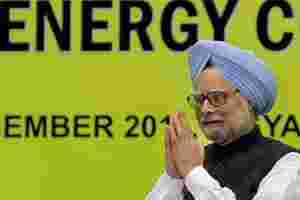 New Delhi: India is exploring the option of routing payments for the crude oil it buys from Iran through Russia, a senior Indian official said on Wednesday, a day ahead of Prime Minister Manmohan Singh’s departure to Moscow on a three-day visit. His visit comes a few days after Russian Prime Minister Vladmir Putin’s United Russia Party won the 4 December Duma (Parliament) elections with a slim margin. Russians have been staging protests against alleged election fraud. Asked if India was looking at paying Iran for crude oil through Russia, Mathai said: “We are looking at all appropriate mechanisms for conducting our trade with Iran." A second official, who wanted to remain unnamed, said the proposal was on the table and may come up during talks between Singh and Russian President Dmitry Medvedev on Friday. Energy-deficient India imports around 400,000 barrels of crude oil a day from Iran and has been trying to resolve an impasse over the method of settlement, after India decided last year to discontinue paying through the 35-year-old Asian Clearing Union (ACU) system. Established in 1975, the system was used by India, Iran, Bangladesh, Bhutan, Nepal, Pakistan, the Maldives, Myanmar and Sri Lanka to reduce foreign exchange spending on account of transaction costs. But with Iran under economic sanctions from the United Nations, the US and the European Union (EU) over its nuclear programme, India pulled out of the ACU after the EU issued a regulation that made it mandatory for any transaction with Iran involving the euro to be accompanied by a certificate. India is currently paying for the oil it buys from Tehran through Turkey. Singh’s visit will be his fourth summit-level contact with Medvedev since 2008, Mathai said. Russia and Japan are the only two countries with which India has institutionalized annual summits of its top leaders, he said. On energy cooperation, a much-awaited pact between India and Russia on the construction of two more atomic power units at Kudankulam in Tamil Nadu seemed unlikely to be clinched during Singh’s visit. Mathai said the “discussions are ongoing" and “at an advanced stage". Russia, which is already constructing two 1,000MW atomic power units at Kudankulam under a 1998 pact, is seeking the same terms for the two new plants. Kudankulam residents have been protesting against the projects over safety concerns. On trade, Mathai said both sides were of the view that the volume at $9 billion was far below potential. An India-Russia CEO meet is scheduled for Friday and proposals on the table included a joint investment fund and increasing connectivity between India and Russia, said Ajay Bisaria, joint secretary in charge of Russia in the foreign ministry.